Pluto, the picked on planet. Always was the odd one out, routinely treated as the runt of the litter, even before it was kicked out of the club of planets altogether in 2006, thanks to a controversial vote held by the International Astronomical Union – at a meeting in Prague, no less. Yet Pluto, so small, so cold, so faraway still inspires an irrational level of protective affection. Kids supposedly like it because it is small, and prone to being bullied. New Zealand, for its part, took a somewhat sceptical stance towards Pluto, right from the start. It is probably larger than the Earth, but smaller than Uranus. These questions give plausibility to the suggestion made by Dr C.E. Adams, the New Zealand Government astronomer, namely: the possibility of an American newspaperman having overheard astronomers expressing the hope that the new planet was a reality. Through a mistake on his part, the new planet may have been announced as a fact. Whether the Americans have come as near to making a corner in minor planets as they have in First Folios of Shakespeare we cannot say, but it is only natural that with their magnificently equipped and magnificently placed observatories they should be able to claim a lion’s share. ..Mrs Elizabeth Aldrich, editor of “The Astrologer” writes that Planet X will enable her to step up her accuracy from 75% to 85%…There are two schools of thought among astrologers. One contends that the planet has always been exerting an influence, for good or evil, on mankind. The other holds that a planet remains absolutely neutral or harmless until it has been discovered, whereupon it begins to operate. This school does not indicate the means by which the planet is advised of its having been ‘spotted’ on Earth. 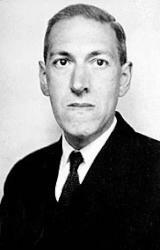 Among astrologers, the Post concluded, there existed some “mild disagreement” as to the identity of the new entrant. 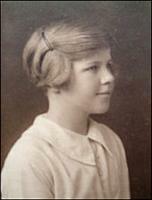 Supposedly, the name “Pluto” was suggested by an eleven year old English schoolgirl called Venetia Burney (left), who told her grandfather who told his friend an Oxford professor of astronomy who relayed the suggestion to the staff at Lowell Observatory at Flagstaff, Arizona who had made the initial discovery. Little Venetia made for a good p.r. angle but this was not the entire truth. Minerva had been the first choice, until it turned out to have been used already, on an asteroid. The astronomer and one-time Lowell employee Thomas Jefferson Jackson See came up with the popular name of Cronus, the son of Uranus – but since his former colleagues disliked See intensely, his suggestion went into the dustbin of history. Pluto was a popular choice with the public, too. Its main downside in 1930 was that many Americans back associated it with the name of a popular and fast-acting laxative, marketed via the memorable jingle “ If Nature Can’t, Pluto Will.” It eventually won the day, although Miss Burney was not the only source of the name entirely. As this research into the suggestions tht poured into the Lowell Observatory indicates, plenty of others had offered the same name as well, but the story of the eleven year old English girl coming up with the name over breakfast tea and toast was too good to ignore. In these days of large telescopes and modern astronomical methods, it seems strange that no vigorous efforts are being made to discover planets beyond the orbit of Neptune, which is now considered the outermost limit of the solar system….. The upshot being – the population of the solar system suddenly looked likely to explode, if all these objects found out beyond Neptune were to be included. It was the same dilemma that had threatened to erupt after the first asteroids were located between Mars and Jupiter in the early 1800s. Then as now, the solar system club just couldn’t handle letting in all the likely applicants. Not everyone took the relegation message lying down. The New Mexico state legislature for instance, quickly enacted a law that declared Pluto to be a planet, at least while it is passing over New Mexico. 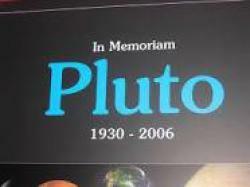 The full text of the New Mexico Pluto law is available here. In similar vein, the California state legislature passed California Assembly Bill HR36, “Relative to Pluto’s Planetary Status” with its full text available here. Resolved by the Assembly of the State of California, That the Assembly hereby condemns the International Astronomical Union’s decision to strip Pluto of its planetary status for its tremendous impact on the people of California and the state’s long term fiscal health.. Promise me /You will always remember who you are…. Oh, Pluto’s not a planet anymore…. Not every scientist bought into the idea of demotion, either. Only 4 % of the world’s estimated number of professional astrophysicists had voted in Prague, as Pluto lovers never tire of pointing out. (Although as Neil DeGrasse Tyson pointed out in his book The Pluto Files, that’s still a statistically significant sample, provided it was sufficiently randomised.) Possibly, the final vote in Prague might have carried more gravitas if the visual aids up onstage had been a bit more…sophisticated. Reportedly, there was a beach umbrella on the podium with the word “planets” written on it, a big blue balloon represented the classical eight-planet solar system, a Disney dog soft toy stood in for Pluto, and a box of Cereal Crunch represented the asteroid, Ceres. Ultimately, only 91 holdouts among the assembled crowd of astrophysicists voted to put the cereal box and the soft toy underneath the umbrella. In fact, Pluto, and its cohorts, are planets. They have all the attributes of planets. Let me give you some examples. They have cores. They have geology. They have seasons and atmospheres. They have clouds. They have polar caps in many cases. They have moons. And I can’t think of a single distinguishing characteristic that would set apart Pluto and other things that you’d call a planet, other than its size. So, I like to say, a Chihuahua is still a dog. 3. It must have ‘cleared the neighbourhood’ around its orbit. i.e it must dominate all other objects on its orbital path. That third condition is the contentious one. Arguably, even Jupiter hasn’t cleared its neighbourhood, given how many asteroids trail before and aft, along its orbital path. Many entities cross over Neptune’s orbit, including Pluto, which has clearly worked out an accommodation with it. The condition of ‘clearing the neighbourhood’ can be a fairly subjective term. And if you picked a different criterion – such as, does it have a moon in orbit around it ? 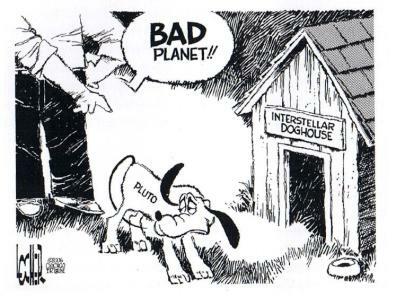 – then Pluto wins the contest hands down. Pluto and its three moons clearly outrank not only Mercury and Venus ( both none) but also Earth (one) and Mars (two). Yay for Pluto. Finally- and to be optimistic about it – the case of Pluto is a useful reminder that any scientific classification system is, at base, pretty arbitrary. (When it comes to Venus for instance, the IAU’s naming committee decrees that any apertures more than 12 miles wide can be named after famous women, but smaller ones must only be given feminine first names. Go figure.) Truth is, a lot of people grew up with the idea that the solar system consisted of the Sun, nine orbiting planets, a belt of asteroids and the occasional wandering comet. 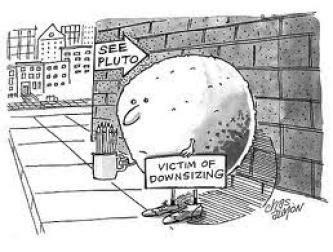 It has been hard for some to adapt to a new vision of the solar system where Pluto isn’t a planet anymore, but is now – at best – merely the prime dwarf planet among many others like it. Or is it a plutoid, or a pluton or whatever you want to call these things beyond Neptune ? Or is Pluto best considered as one of several Trans-Neptunian Objects, given that its eccentric orbit carries it at times closer to the sun than the orbit of Neptune ? Even weirder, maybe Pluto should be classed as a “scattered disc” like Eris, one of several entities affected by the gravitational force of Neptune, and the other gas giants. Or should Pluto be best considered as being a mere visitor from the Kuiper Belt, that recently discovered spooky neighbourhood of assorted planetary entities out beyond the solar system? Or is Pluto really a creature from the even more distant Oort Cloud of wandering comets, that also seem to swing in long, slingshot orbits around our sun? Clearly then, the demotion of Pluto hasn’t returned us to a safe and secure set of the eight pre-1930 classical planets. Things will never be the same, especially as the Kuiper Belt and the Oort Cloud gradually reveal their secrets. Perhaps – as Tyson suggests – the varied contents of the solar system can be sliced demographically any which way you like, depending on your field of interest. Understanding Pluto leads us forward to a view of a porous solar system where things overlap at the boundaries in ways we are only beginning to understand. Meanwhile, our protective feelings towards Pluto are very likely to endure. This icy little whatsit isn’t going anywhere, fast. Come 2015, when the New Horizons space probe finally reaches Pluto and heads into the Kuiper Belt, Clyde Tombaugh’s baby can count on enjoying yet another spell in the news spotlight.